A new environmental group on campus, Rethink Dams, is advocating for the removal of the four dams on the lower Snake River. Sophomore Fiona Bennitt formed Rethink Dams after she was inspired by the documentary "DamNation." The new group will work to raise awareness both on campus and in the wider Walla Walla community and to educate people about the potential benefits of breaching the Ice Harbor, Lower Monumental, Little Goose and Lower Granite dams. All four dams are located in the southeast corner of Washington. "I see this as an issue of science, with wild salmon runs just not coming back despite the tremendous efforts that the Army Corps has made to [encourage] their return. They have done a fantastic job, they have tried really hard, but [the salmon] are just not coming back," said Bennitt. Breaching the dams is an ambitious goal. Rethink Dams hopes that its efforts will not only inspire Whitman students and Walla Walla residents to support breaching, but also inspire the creation of chapters at other colleges and universities in the region. "As a campus, it's our hope that we inspire . . . other schools in the Northwest to form their own groups, and [it will] eventually become a big enough issue that enough people know about that the dams will come out," said sophomore Godwin Peck. The debate over whether to remove the lower four dams on the Snake River is not new. 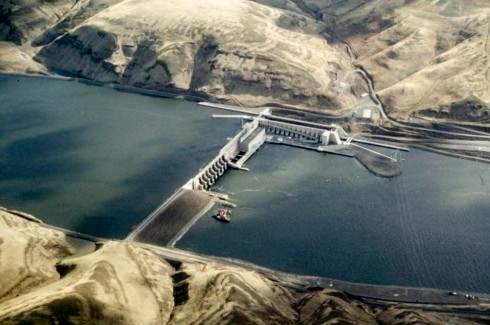 In the early 2000s, the Walla Walla District Army Corp of Engineers conducted a six-year long, 30-million-dollar study on how to address the damage done by the dams to populations of wild salmon, which are on the endangered species list. The Army Corps decided at the time to install expensive measures to help fish move past the dams. Jim Waddell, once the top civilian at the Walla Walla District Army Corps of Engineers, has recently advocated for the corps to reconsider dam removal. After retiring, Waddell reviewed the thousands of pages of the Lower Snake River Juvenile Salmon Migration Feasibility Report and found a number of errors. He is now convinced that removing the four dams would not only save wild salmon runs but may save the corps money in the long run. Waddell met with Bennit in late January and encouraged her to start Rethink Dams. "It is great to see your generation wanting to take an active and meaningful role in solving some of the nation's challenges. Many of the challenges we face can no longer can be put off onto some later generation by my generation. It is very important that we approach the solutions to the challengers as a multi-generational team," said Waddell in an email to The Pioneer. Alongside saving the salmon and economic sense, members of Rethink Dams cite increased recreational opportunities as another reason to support breaching the dams. Breaching would open up 200 miles of free-flowing river for rafting and kayaking. In response to recent advocacy for breaching the dams, the Walla Walla Corps of Engineers issued a statement that they have no intention to further examine the economics or environmental benefits of dam removal, and that any decision to remove the dams must be made directly by Congress. "What you have to do is convince people that the benefits of removing the dam are greater than the costs . . . The most important thing would be to get the support of the Washington legislators from eastern Washington, and that's about impossible," said Professor of Geology and Environmental Studies Bob Carson, who has worked toward the removal of various dams around the Pacific Northwest for 40 years. Opponents of dam removal argue the dams are needed to generate clean energy and allow shipping up and down the Snake River. The four dams on the lower Snake produce five percent of the energy used in the Pacific Northwest. In addition, the reservoirs formed by the dams provide water for a few large agricultural producers. "I don't necessarily think that dams are a bad idea, and I don't think that every dam should come out, and I don't think that most dams can come out," said Bennitt. "But I think when we come across a dam or set of dams where it's really starting to become questionable why they're kept in place . . . that we should investigate those structures and look into whether they should be breached or not."